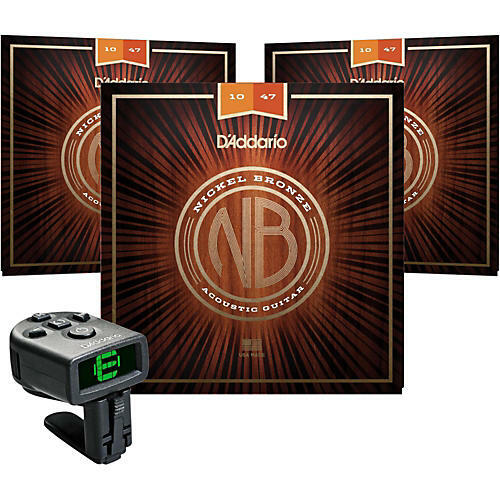 The D'Addario NB1047 Nickel Bronze Extra Light Acoustic Strings 3-Pack with FREE NS Micro Headstock Tuner is an easy to stock up on strings and get a free headstock tuner while you're at it. Introducing D’Addario’s new premium Nickel Bronze acoustic guitar strings. While many strings add color to a guitar’s tone, these strings simply highlight a guitar’s inner character, allowing your instrument’s natural frequencies to truly shine. Nickel Bronze provides a guitar with unrivaled clarity, resonance and projection, as well as outstanding balance and harmonically rich overtones. Since this uncoated set also features D’Addario’s proprietary NY Steel core, players will also enjoy improved tuning stability and higher break resistance.